Thank you for your interest in joining the Platinum Parking Team! Platinum Parking enjoys hiring the best people! 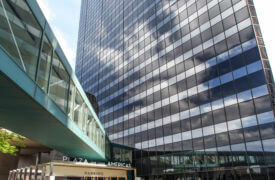 Founded in 1999, we are headquartered in Downtown Dallas, Texas. In 2009, Platinum Parking acquired a valet company based in Dallas, Advantage Valet. In 2011, Platinum Parking acquired a parking company based in Houston, Merit Parking. With parking and valet operations in Dallas, Fort Worth, Austin, Houston and New Orleans, Platinum Parking has over 35,000 parking spaces under contract in a portfolio that includes Class A office buildings, mixed use projects, residential properties, stand-alone garages, surface lots and event parking. We offer the best managers and parking employees in the industry – fill out the Application below to get started! 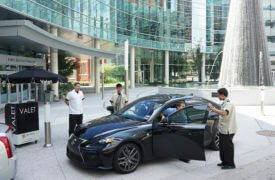 Our Valet Services offer the best in courtesy, speed and service – join the best today! Platinum Parking offers top tier expertise and industry experience so we look forward to meeting you. Once an employee is hired, the most important first steps are to properly train the employee and arm them with the knowledge to provide the best service to our clients. New employee orientation includes the mission and vision of our client and how to become a “parking ambassador” for the location, Platinum Parking and the surrounding neighborhood. All Platinum Parking employees must act in a professional, friendly and courteous manner at all times. Customer service and satisfaction are integral to the service that we provide to our client’s customers. Our training process ensures that employees are courteous, approachable, presentable in appearance, attentive to our customers’ needs, responsive to our customers’ requests and accountable for their actions. The premium parking services offered by Platinum Parking take into account the experience of your guests and serves to represent your organization in the manner you would expect from your own employees. We keep our surface parking lots looking clean, safe and welcoming; with easy to understand signage and friendly staff. All parking personnel are cross-trained to handle any situation and provide assistance with maintenance, cashiering, equipment repair and customer service. Due to the dynamic nature of our facilities, this training will ensure that any change in demand can be met immediately. By cross-training every employee, Platinum Parking can provide excellent, consistent service while maximizing the financial return of the parking operations at each and every location that we manage. Recruiting new employees can be handled with a variety of methods depending on the need and scope of work. Platinum Parking employees are recruited through internal promotions or transfers, public advertising in papers or online, notices at area colleges or universities, and/or employee and client referrals. Each applicant is interviewed by the facility manager and any final candidates are interviewed by the executive management of Platinum Parking. Upon selection of the right person for a position, our facility client is given the opportunity to interview the chosen candidate prior to an offer of employment. Do your parking facility managers and attendants know how to spot and prevent a terrorism attempt on your garages and lots before it happens? Platinum Parking’s employees are enrolled in an important training program designed for everyone involved in the protection of your operations, assets and customers. Orchestrated by the National Parking Association (NPA), First Observer™ is a national terrorism awareness program that uses the skills, experiences and “savvy” of Americans who spend a good part of their working day in America’s surface transportation arena. The program recruits and trains volunteers to be “First Observers” for recognizing and reporting suspicious activities. First Observers are trained to observe, assess and report in support of the national preparedness guidelines. The First Observer™ Outreach and Training program provides a unique opportunity for Americans everywhere to be certified in this national program. The program also is designed to train thousands of parking industry employees nationwide, reporting anything suspicious – such as abandoned cars or individuals lurking on premises or posing unusual questions. It is sponsored by the Federal Emergency Agency and is administered by the Transportation Security Administration. Standard Operating Procedures (SOPs): The SOPs for the facility include a section instructing the employees to be watchful of potential liabilities and will provide examples or warning signs that may indicate the presence of a risk to the property or people. Also included is an Emergency Plan, providing employees with clear instructions in the event of an incident. Employee Attitude: Alert, interested, dedicated and well-trained employees are the most critical weapon in combating threats and risks to people and property. Communications: Each facility is provided with a means of communicating (telephone) with the Garage Manager and with management outside of the garage who are able to respond to any issue, including an emergency or threat situation. Parking facilities are supported 24 hours a day through on-call and regularly scheduled Managers and Supervisors. In keeping with the high class look and feel of each of our parking facilities, we understand the importance of the appearance of the personnel uniforms. All uniforms are reviewed and approved by the client prior to ordering and issuance to the employees. We typically outfit the cashier/attendant and maintenance staff with custom Platinum Parking shirts and tan pants. All personnel are required to wear black shoes and maintenance personnel are required to wear black “safety” shoes or boots. When providing uniforms to personnel, we provide an adequate number of pants and shirts to ensure that sufficient time is provided between wears for laundering. Platinum Parking has found that communicating closely with our employees and providing options for them to communicate with management provides a working environment that improves and matures each day. All employees have a chance to discuss issues, have their questions answered and are encouraged to voice suggestions for improving the operations and the work environment. 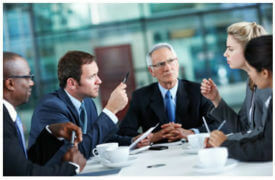 For those employees that do not feel comfortable in discussing items out loud we have other avenues they can pursue.